This is a 19th century serene temple dedicated to the goddess Saraswati- the Hindu deity of learning, literature and art. The picturesque lotus pond and water garden add to the charm of the holy temple. This temple is decorated with so many fine carvings inside the Padmasana shrine located in the northeast and also contains bale barong, giant masks, and statues of Goddess Saraswati and the devil Jero Gede Mecaling which are as high as 3 meters in front of the temple. 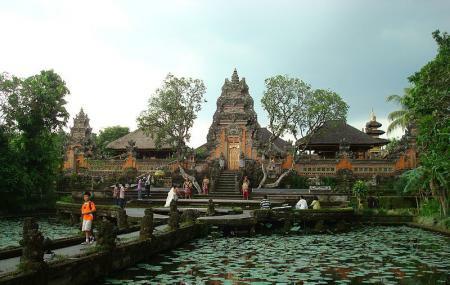 The temple is frequented by local worshippers and is a must-visit temple is Ubud. Get the most of this attraction by creating a plan using Bali trip planner. Also, visit the popular attractions in the city by following Bali itinerary 4 days. Do not miss the evening performances held once a week. The daytime has excellent presentations from local painters. Ticket price for dance performance: 80,000 Rp. Dance performance is held by night : everyday except Friday. How popular is Pura Taman Saraswati? People normally club together Neka Art Museum and Pura Ulun Danu Bratan while planning their visit to Pura Taman Saraswati. Absolutely stunning place that was very serene. After walking in you see a beautiful pond and the temple's architecture is out of this world. Just disappointed we weren't actually able to go inside the temple itself, but otherwise worth checking out, especially if you're seeing the palace which is right next door. Entry to Saraswati Temple is free. It is right beside Starbucks. Upon entering, you would immediately notice the beautiful lotus pond leading up to the temple. We were able to visit the temple after 4PM & there were only a few tourists during that time. Simply beautiful. Beautiful place with stunning architecture. Definitely worth visiting! Locals are friendly and are keen for a conversation with tourists. Just watch out on roads around, it's really crazy with traffic over there and really easy to run under a car or a scooter.